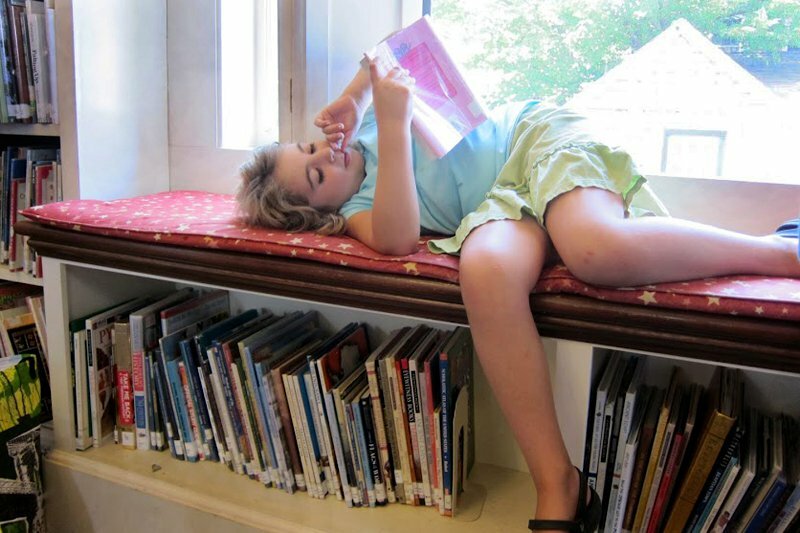 Getting lost in a book at the Weezie Library for Children. Photo by Nancy Picchi. 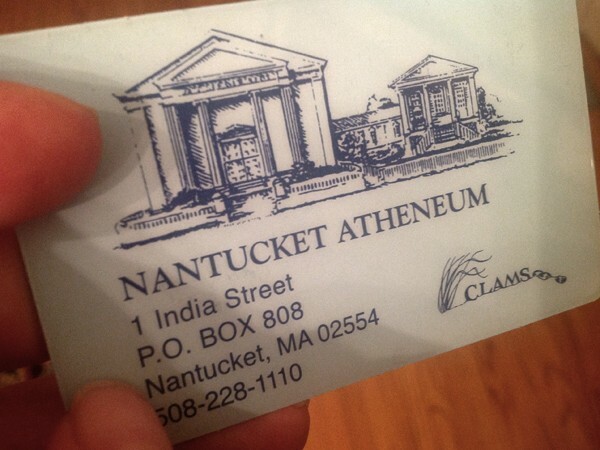 A lifetime Nantucket-goer and reader has an unlikely favorite place on the island: the legendary Atheneum Library. 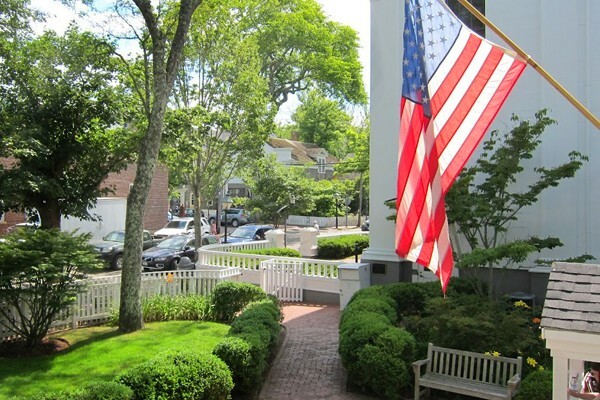 NANTUCKET – I come from a family of readers. For some, Nantucket conjures images of beaches, hydrangeas, and girls in Lily Pulitzer shifts. 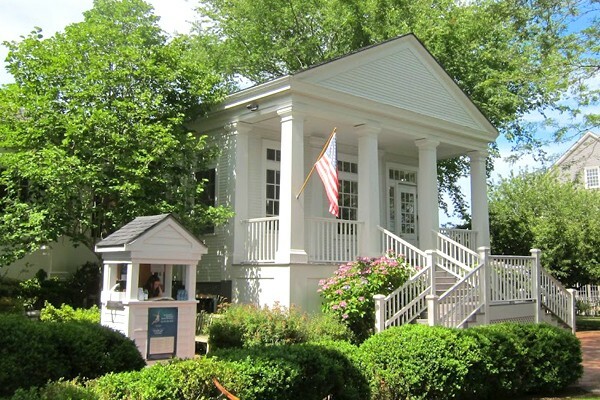 For me, Nantucket is synonymous with the Atheneum, the faraway island's beloved library. My family has been vacationing in Nantucket since the 1980s. My husband, kids, and I live on the other side of the United States in Los Angeles, but every summer we make the long and long-awaited trip to spend a couple of weeks with our extended family on The Grey Lady. 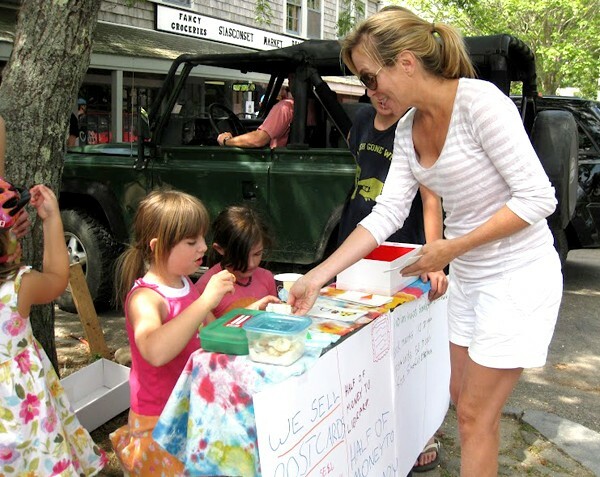 My kids don't know a summer without Nantucket, a tradition that started with my first maternity leave on the island when my daughter Ava was eight weeks old. My mother Nancy is a librarian, and she made sure that some of my fondest and earliest memories included libraries and bookstores. This tradition continues with me and my kids and our own trips to libraries at home and on vacation in Nantucket. A big part of our island life involves pilgrimages to the Atheneum so we can stock up on books and movies. As geeky as it sounds, I relish the two weeks every summer that I get to whip out my lovely blue Atheneum library card. 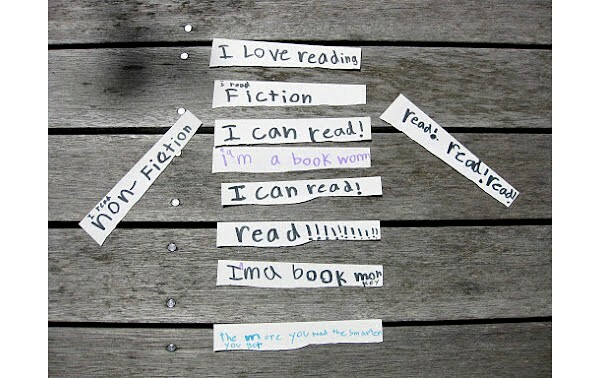 Anyone who owns a property can get a library card for free. Everyone else can get a card for $25. It's good forever. Views of the Atheneum: The main building, the view from the library onto India Street, and the Weezie Library for Children. Photos by Nancy Picchi. 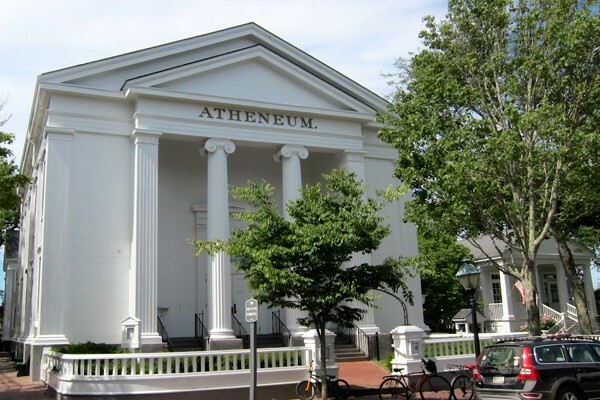 The original Atheneum was founded in 1834 and opened its doors with 3,200 volumes. The island's celebrated Maria Mitchell served as the institution's first librarian. The original building was destroyed in the Great Fire of 1846, but residents pushed to have the Atheneum rebuilt quickly, and the next incarnation and current building opened its doors in 1847. The building designed by Frederick Brown Coleman is an impressive example of Greek Revival architecture. The proud result: a big check for the library. The library has long served as a gathering place and has hosted an impressive list of speakers throughout the years, including Frederick Douglass, Lucy Stone, Ralph Waldo Emerson, and Henry David Thoreau. The building was also the site of abolitionist meetings and suffrage conventions. Today, the library continues to sponsor guest lecture series, classes, children's events, and even a summer dance festival. 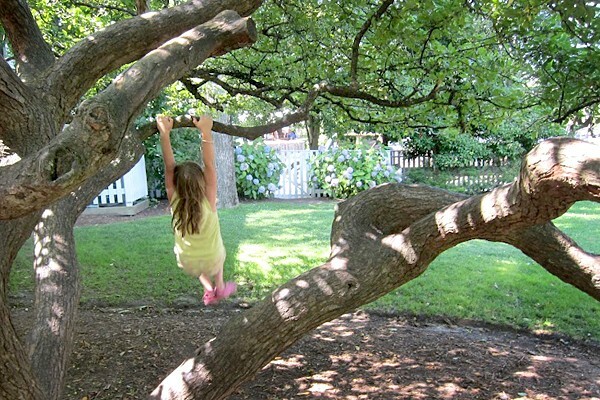 Swinging on trees outside the Weezie Library for Children. 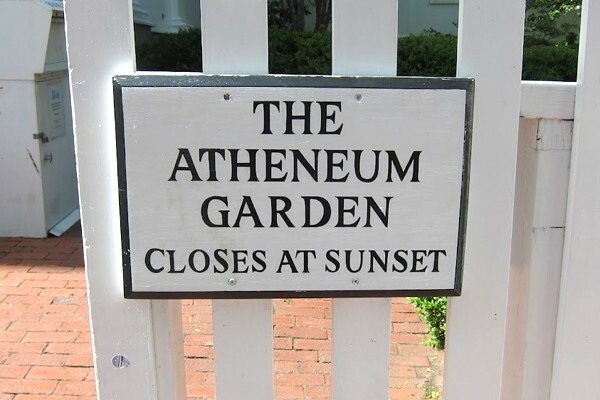 The Atheneum Garden offers a tranquil outdoor spot for readers or anyone who wants a break from walking around town. In 1996 the building went through a renovation that restored the second floor Great Hall for lectures and research as well as built the beloved East End Weezie Library for Children, built in the mid-1990s and named for Louise Frances "Weezie" Walker, who died in 1959 at the age of 10 from a tragic accident. The Atheneum relies on raising 60 percent of its budget through special events and private donations. Our family did their share last year with a variation on a lemonade stand in Sconset. 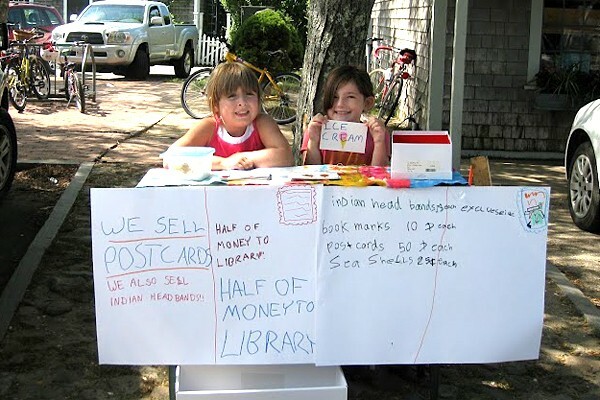 Instead of lemonade, my ten-year-old daughter and niece sold handmade items such as postcards, bookmarks, and decorated seashells, promising to donate half of their proceeds to the Atheneum. The girls raised $16.10 for the library. 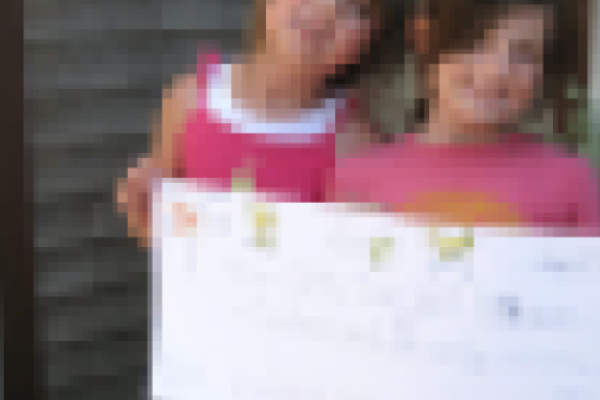 They made their own big check, just like they'd seen Publishers Clearing House do it, and presented it to the librarians (with the actual money, too). In return, the librarians sent the girls charming thank-you notes and Atheneum lapel pins. And a third generation of Nantucket readers adds to their own happy Atheneum memories. Nantucket Dance Festival 2012 (July 24-28): Brought together by Benjamin Millepied, choreographer and former New York City Ballet principal dancer. My daughter was totally captivated last year by Swallows and Amazons by Arthur Ransome. It isn't set on Nantucket but it is perfect to read after a day at Sesachacha pond. Our kids are looking forward to the day when they can take a sailboat out on the pond by themselves to have their own adventures. I can't imagine a better location from which to read of In The Heart of the Sea: The Tragedy of the Whaleship Essex by local resident Nathaniel Philbrook. I usually read the latest by another Nantucket writer, Elin Hildenbrand. This year it's Summerland: A Novel. These are not great literature. These are classic beach reads that do a good job of capturing favorite places around the island.